By Hongkiat Lim in Social Media. Updated on December 9, 2016 . Let’s be honest, if you use Facebook, you probably use it to stalk or spy on your friends, your favorite idol, your crush (ahem, we know), your ex, your boss etc. If you have a large list of friends, it may be hard to keep track of what everyone else has been doing so far. That’s a lot of Timelines to go through. But wait. 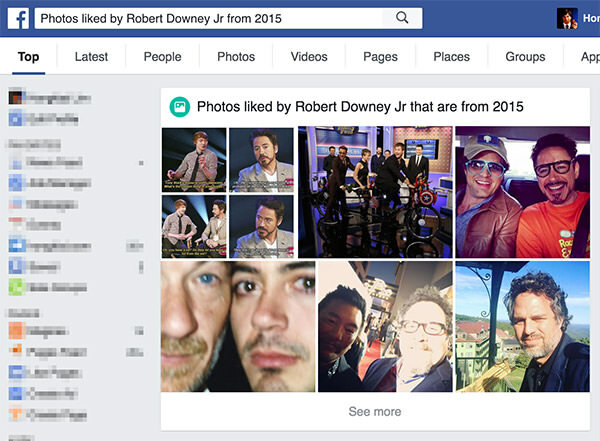 There’s actually a much easier way to see all the photos your friend, or anyone else for that matter, has liked. Think of it as a Like collection, and this is the way you can access it, even without their consent. 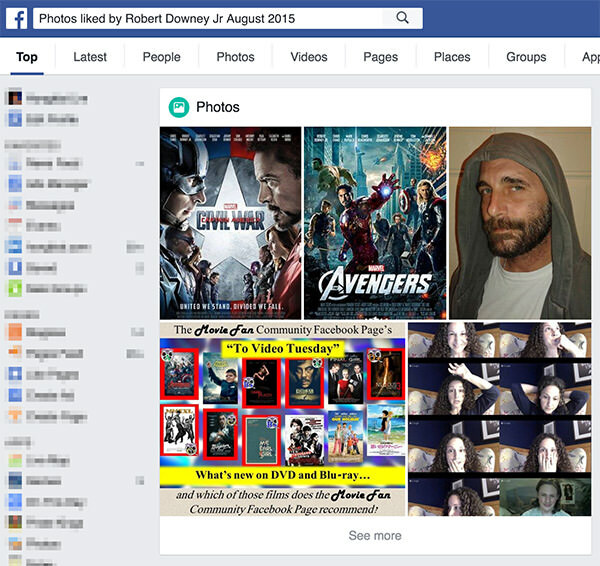 You can even find out what photos they have liked today, yesterday, within this month or last month, or even this past year. Are you up for it? Let’s do this. I’m a fan of Robert Downey Jr. If you’re not you’re probably on #teamcap. Anyways we’re going to find out what RDJ’s likes look like. 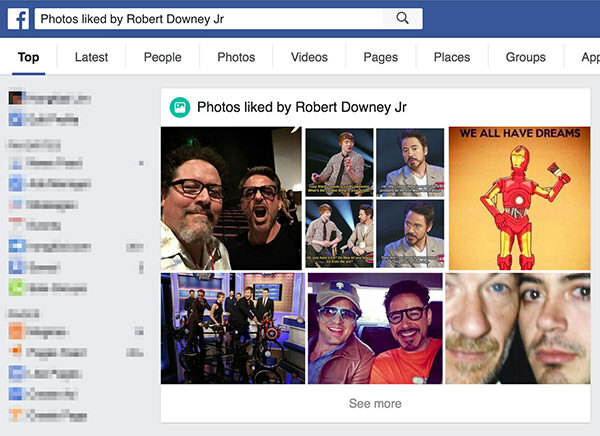 "Photos liked by Robert Downey Jr"
"Photos that Robert Downey Jr liked"
Both commands do the same trick. 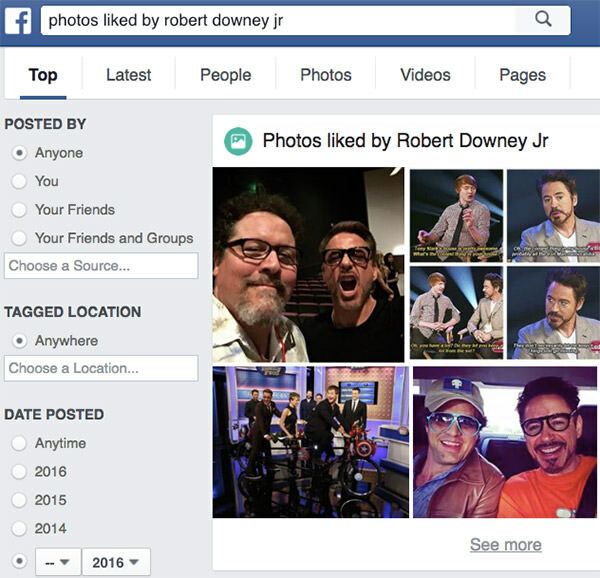 It returns you a handful of photos RDJ has ever liked. Click ‘see more’ at the bottom of the displayed photos, and keep scrolling for more. 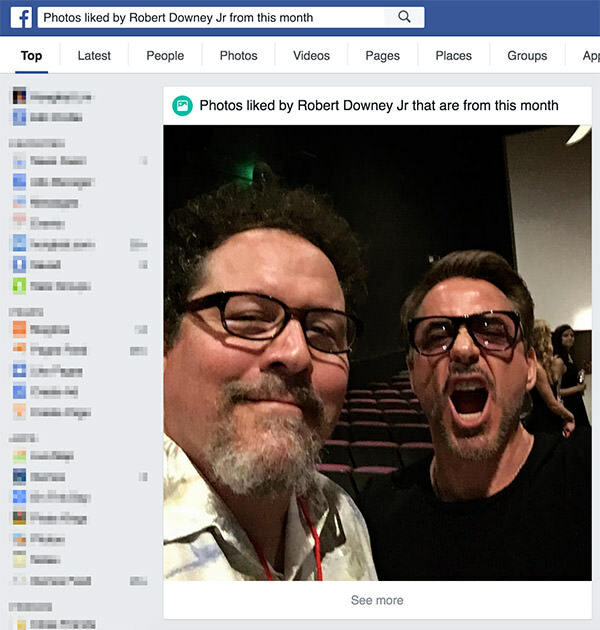 "Photos liked by Robert Downey Jr that are from 2016"
"Photos liked by Robert Downey Jr from 2016"
"Photos liked by Robert Downey Jr from this week"
"Photos liked by Robert Downey Jr that are from this month"
"Photos liked by Robert Downey Jr from last year"
"Photos liked by Robert Downey Jr August 2015"
"Photos of Chris Evans that Robert Downey Jr liked"
Note: After the first results are displayed, on the left sidebar are options that let you further filter the results by Person (you, friends, group), Location, or Date. The results are the same as the search queries used above though. On top of that, the sidebar doesn’t show for some people, some of the time. Know that using this seach you can also run a check on the photos that you yourself liked at any point in time. Just use the same queries but change the person to I or me. With this method, the photos that turn up in the search result are those that are available based on the permission settings. 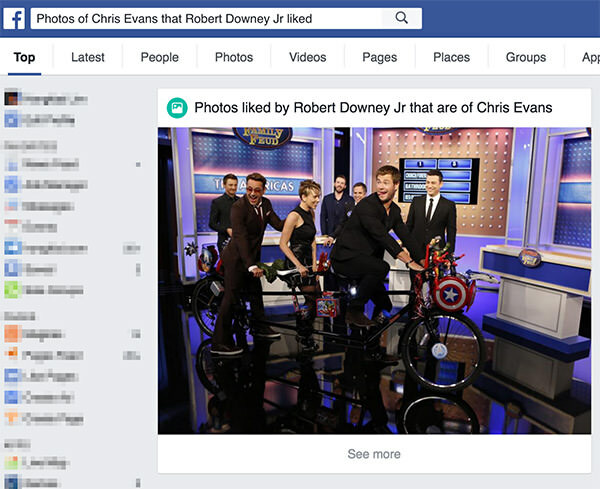 If you are friends with Robert Downey Jr, the query returns photos that he has been set under Friends only permission. Otherwise, you get only photos shared under the Public setting. This means that you won’t be able to access photos that are shared under Only Me or images that have been shared in Closed Groups. Understandably, the larger your pool of mutual friends, the more personal photos you might stumble upon. So there you have it, with these commands, you may start on a searching saga. But before you begin, you probably want to start reviewing what you yourself have liked first.